There is no greater feeling than brewing your own shot of espresso in the comfort of your own home. That’s why we went ahead and created this guide to the best espresso machines. The pleasant aroma of brewing espresso fills the house with the warmth and love of coffee and espresso. It is no surprise that an espresso machine is often one of the most sought after machines for kitchens worldwide. Before you can even buy an espresso machine it’s vital to understand what an espresso machine actually is. An espresso machine is simply a machine that utilizes pressurized water to force ground espresso coffee through a filter to produce more concentrated, thick and creamy form of coffee known as espresso. Today, given the advancements in technology, there are numerous espresso machines that can do much more than just this. For an example, some espresso machines can also steam and froth milk simultaneously. One of the most common questions that people ask in coffee shops around the world is: What is the difference between espresso and coffee? First and foremost, one of the main differences between espresso and coffee is the way it is made. If you did not know, there are not any actual ‘espresso beans’ to create ground espresso. In fact, espresso is made from a blend of different coffee beans. With that being said, espresso grounds are considerably finer than regular coffee grounds. In that, the process to make espresso involves an intense amount of pressure to compact and produce a thick and concentrated form of coffee. On the other hand, coffee involves boiling water dripping over the coffee ground. Unlike espresso, coffee utilizes the pressure of gravity to create a fresh cup of coffee. In order to get started, there are two important products that you will want: a top-rated grinder and a top-rated home espresso maker. Now, there are lots of top-rated espresso makers that come built with a grinder; however, the price is adjusted accordingly. While learning to use your espresso machine may take some time – the time spent is more than worth it. To be truthful, the time spent learning is more about learning your taste buds and preferences than learning to use your espresso machine. Today, many companies value simplicity and user-friendliness. With that being said, if you have the opportunity to join the espresso movement, do it. Before we get into any other machines, we’d like to draw your attention to the Mr Coffee Cafe Barista Espresso maker. It’s one of the best mid-range espresso machines that combines the top features of both worlds. It’s relatively inexpensive, much like lower end machines, but it also has some degree of automation like higher end machines. Of course, there’s no built in grinder, but that’s a bonus feature. The machine does pretty much everything for you after you’ve put the coffee in and it brews some really good coffee. Simple fill up the reservoir, push the button to start brewing, and it will brew your specified quantity of coffee. 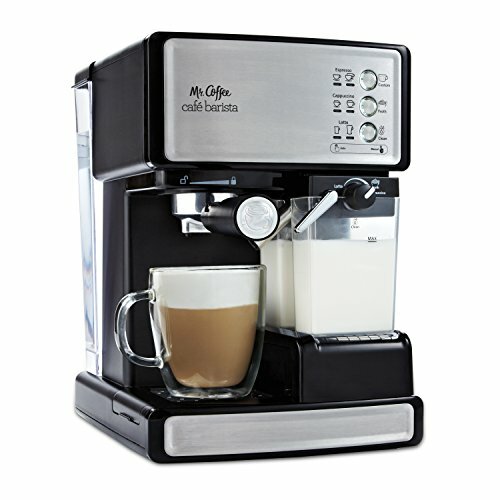 There is an automatic milk frother built in, too, so you’ll be able to make nice and frothy cappuccinos too. The drip tray, filter basket, and water/milk reservoirs are easy to remove and clean, too. 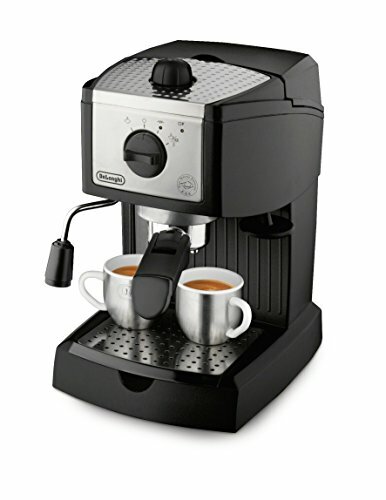 A semi-automatic espresso machine is one of the most common and affordable espresso machines. The other variant for the user is a programmable semi-automatic espresso machine. The user will still have full control; however, there are programmable features. Most notably you’re able to select beverage size – so you can get an exact amount of coffee every time you brew. The elite machines in the industry are more than likely super-automatic. Have you ever gotten a glance at the machines that restaurants and coffee shops use? These are them. Each super-automatic machine comes fully equipped with all of the bells and whistles. The user will not be required to do much as the machine will do it all. This includes frothing, steaming, grinding and extracting. All you have to do is press a button and you’ll get excellent espresso. Capsule or Pod Espresso Machines are relatively new to the market. These machines are actually made from pre-packaged capsules of different aromas and flavors of coffees and espressos. These machines function based off of specific capsules and often are easier to use than other machines. However, the cost of these machines can get quite high and some coffee purists will say that these are not “true” coffee machines. In the semi-automatic espresso machine industry, this is the number one rated semi-automatic espresso machine. This machine is built with some of the most impressive features. In fact, this machine could be rated number one across all espresso machines; it is that good! This comes built with stainless steel boilers and duel pumps to produce espresso and steamed milk or froth simultaneously. Built with an OPV, or over-pressure valve. With a backlit LCD display, the user will always know the temperature, the shot time and be able to gauge the temperature for the perfect espresso shot. A 58-mm commercial grouphead, which assists maintaining the perfect temperature. If you want your espresso ready at a certain time, the Breville has an automatic start feature where the user can program a specific time to begin brewing. When it comes to compact espresso machines, the Mr. Coffee Café Barista Espresso Maker is easily one of the best in the industry. Weighing in at only 9 pounds, it’s also one of the lightest espresso machines. For the user that is seeking a small espresso maker that won’t take up much counter space, this one is perfect. With outstanding features and the ability to produce the richest shot of espresso, you can’t go wrong with this one. The Mr. Coffee Café Barista comes built with a one-touch control panel. This allows for the user to dictate a one-shot or double-shot of espresso, latter or cappuccino. As the name insists, the machine comes built with an automatic milk frother. The machine is adjustable so the user can decide what type of cup or size cup they will be using. The Mr. Coffee Café Barista comes equipped with a 15-bar pressure pump. This is an impressive feature as it guarantees a flavorful and creamy sip of espresso. The Gaggia 14102 Classic Espresso Machine is known as a true espresso beast in coffee making circles. It is one of the heaviest and largest machines in the market. While this could be a turn-off for some, the machine comes built with a beautiful stainless steel design and impressive features. The Gaggia Classic Espresso Machine is one of the fastest espresso makers in the industry. Built with a 3-way solenoid valve, the pressure system and grouphead function to produce a delicious and efficient shot of espresso. This machine is made from some of the highest-grade of material. In fact, the grouphead is made of marine-grade brass, which is perfect for maintaining the high levels of pressure and temperatures. This allows for the user to have a full-bodied shot of espresso. The Gaggia Espresso Machine comes equipped with an impressive 72 oz removable water tank. In comparison to it’s competitors, this machine comes built with a 17 ½ bar pump with an intense boiler to produce the BEST shot of espresso. Built into the heart of the machine, the user can also make steamed milk and froth. Reaching this level of super-automatic espresso machines, this is the pinnacle, the crème de la crème. If you want the best espresso maker that has swept the awards across the world, the Jura Giga 5 Automatic Coffee Center is it. To be honest, words actually cheapen the perfection and beauty of this grand piece of innovation. This machine is the number one rated espresso machine in our books, period. With two ceramic disc grinders, this is the fastest and quietest espresso machine in the entire industry. Built with a TFT, or Thin-Film Transistor, display front-screen. For an example, the user can have a one-touch espresso, latte, macchiato, cappuccino, frothed milk, hot water, and assortment of coffees. The most impressive feature is that it comes built with separate chambers for grinding and brewing. In other words, an individual can make two coffees at the same time. The Jura Giga comes with an Intelligent Pre-Brew Aroma System, which maximizes the smell of the espresso, one of the most important parts! With a thermoblock heating system, every single shot will be perfect. When it comes to espresso makers, you can’t go wrong with a DeLonghi machine. They are known across the world as one of the best and most innovative pieces of machinery. Not only are they visually appealing, they also come built with some awesome features. This machine minimizes the transferring of espresso grounds and beans. With a bean-to-brew system, the user does not need to grind their own coffee as the machine does all the work. This maintains the quality and integrity of the bean. Built with two stainless-steel boilers for the perfect temperature. Also comes with an instant-reheat function to make sure each shot stays the perfect temperature. Due to the De’Longhi’s Cappuccino System, each espresso shot is guaranteed the richest and densest froth in the industry. Completely user-friendly with a control-panel and one-touch system. Removable water tank and bean container. With different spigot height, the user can select the perfect size of espresso or coffee. Customizability is important to De’Longhi. They created a machine that allows the user to determine the strength of the espresso. Many of the different super-automatic espresso machines can often be a bit pricey. The Gaggia Super automatic Espresso Machine was built to bring the quality of super automatic machines at a cost-effective level. With some impressive features and add-ons, this could easily be one of the top-rated high end espresso machines. Built with the user in mind. This machine is one of the easier espresso machines to use. With a simply push button, anyone can handle making a shot of espresso. 1400 watt motor, which is perfect for the finest grounds of coffee and the best tasting espresso. Extremely light-weight and compact. This is perfect for the consumer who want an affordable, cheap and moveable espresso machine. Very easy to clean with removable parts. This machine has the opportunity to save energy with a standby mode. Just when you thought technology could not get any better, Nespresso surprises us all. With the first ever “connected” espresso machine, Nespresso has developed a machine that can develop a delicious cup of espresso from a touch of your cell-phone. This is just one of the list of impressive features this machine offers. A connected Nespresso Machine. What this means is your cell-phone can make your cup of espresso. Whether you are on iOS or Andriod, all you need to do is download the app. You can then manage your stock, program your brewing times, brew from your phone and even get alerts about your machine. Built with a 19 bar high-pressure pump, making every espresso shot as if you are the barista. The perfect flavor, temperature and aroma is ready in under 25 seconds. Energy saving feature after inactivity. The 27 oz. water tank is rotatable, making it perfect for every kitchen. Ability to program ristretto, espresso and lungo shots. Each capsule is design with your taste in mind. With different aromas and tastes, every single Nespresso shot is perfect for you. De’Longhi has reached the market of capsule and pod machines. The Latissima Touch is one of the most beautiful pieces of technology. With numerous flavors from the Nespresso capsule line, every single shot from this machine is bound for greatness. Built with a 19-bar pressure pump. Every single espresso that is made from this machine will be of the quality of a barista. Offers 6 different options for the user: latte macchiato, hot milk, long, espresso, ristretto, and cappuccino. Machine comes provided with the infamous “automatic cappuccino system.” The user will always get the perfect amount of rich and long-lasting foam. De’Longhi has mastered the temperature and heating times. Each shot will be ready within 25 seconds. Simplicity was the theme for this machine. With one-touch technology, your favorite drink is only one touch away. Mess-free and easy to clean. With capsules and pods, you will never have a mess. All you need to do is throw away the capsules. The definition of beauty in espresso machines has been redefined by this modern and pristine machine. Nescafe Dolce Gusto Stelia represents a new generation of espresso machines and has just the features to match it. This machine is considered a mult-beverage maker as it can produce not only espresso but also lattes, cappuccinos and americanos. This machine can also make the popular chococcinos as well. This machine is built with an Intuitive HMI Interface. Intelligence is at the core of this beast. It will turn off after minutes of waiting idle. Since the machine is a pod-based machine, there are a variety of options of flavors and aromas to use. Packaged with a 1-Liter water tank. Personal recommendations for every single shot of espresso and drink. This machine will deliver 15 bars of pressure, which is perfect for the at-home cup of espresso. The machines listed above are mostly higher end and will take a bite (or a sip, if you will) out of your wallet. Of course, there are cheaper machines available, but they’ll come with certain drawbacks that you’ll have to live with. The drawbacks in these espresso machines won’t be dealbreakers, of course, but you’ll certainly notice the difference between a shot of espresso brewed in a lower end machine and a shot brewed in a high quality espresso machine. Lower end espresso machines are usually made out of plastic and may feel cheap to the touch. Espresso machines are quite simple devices after all – they’re just heating up water, turning it into steam, and forcing it at high pressure through espresso grounds. Higher end espresso machines will have much better finishing, will feel more solid to the touch, and of course, will have better quality parts. The likelihood of a cheaper machine breaking is much greater than that of a higher end machine. This is a factor I’ve noticed extensively. I’ve used both budget espresso machines and higher end ones, and there is a significant difference in the quality of the brew. Better machines have more accurate temperature control, have a better portafilter, and are able to force the steam through with far more pressure than lower end machines. My cheap everyday machine, for example, produces a very weak crema on my espresso, but a higher end machine at my uncle’s house produces a thick layer of rich crema, even if we’re using the same espresso grounds. So while you’ll get espresso from a cheap machine, you’ll get espresso from a higher end machine, there’s no doubt about it. Very budget espresso machines will not have many features besides just the ability to brew some espresso and possible froth some milk. You won’t really be able to control the strength, nor will you be able to adjust how much espresso is brewed – the machine will just brew as much espresso as the amount of water you put in. The strength is usually selectable using a slider but it’s not very accurate and you may not be able to tell the difference – but in a good espresso machine, the difference between two strengths will be stark and noticeable. As far as extra features go, the capability to steam milk is important. Budget espresso machines will either not have steam wands, or they’ll have really cheap ones that won’t froth the milk as well as a good machine can. Again, you can froth milk with a cheaper steam wand, but when you froth it with a higher end machine and a lower end machine, you’ll notice the difference. Please bear in mind that I’m not discouraging you from getting a lower end espresso machine. In fact, I’d just like to point out the differences so you know what to expect. Often, it’s hard to justify spending such a large amount on a coffee machine, and if you’d just like to get your feet wet, a budget machine is absolutely the best way to go. Once you’re addicted to espresso machine coffee, of course, you can always get a bigger machine :). If machines in general are not your cup of coffee but you still want to enjoy espresso, there are still other alternatives. Perhaps you’re a road warrior that lives on the go. You love espresso but you’re not able to lug around a huge machine everywhere you go. There’s a solution for you, too. Espresso has been around for a long time so while espresso machines are relatively new technology, the brewing method can be done in a number of ways. For road warriors and travelers, the best portable espresso machines are moka pots(or stovetop espresso makers) or Aeropresses. Moka pots, or stovetop espresso makers, are brilliantly designed gadgets that use the same principles as espresso machines do to brew some really rich espresso. There are two chambers in the moka pot. The bottom chamber is where you put it coffee grounds and water. The bottom chamber is connected to the top with a thin pipe, which has a hole at the very top. As the water heats up, it brews the coffee, turns into steam, and is forced up the pipe and into the top chamber. Since the coffee is vaporizing and then rising, all the solid grounds remain in the bottom chamber and the top chamber fills up with delicious coffee. Moka pots come in all sizes, from large 6 cup models to smaller personal models – even if you go camping, you can use a moka pot to make some espresso on a camping stove or campfire. Another way to brew espresso on the go – and indeed at home, too – is an Aeropress. 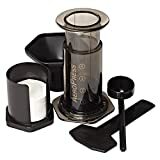 The Aeropress is a bit of a radical idea in the espresso machine world but considering its popularity the manufacturers are certainly doing something right. The Aeropress uses gentle pressure to brew very smooth and rich coffee. You’re also encouraged to use lower temperature water, which agitates the grounds less and produces a lower-acid brew. You simply put in coffee grounds and water in the chamber, stir for about 10 seconds, and place the plunger in. Place the entire device on a coffee mug, and start gently pushing down on the plunger. Since it’s a vacuum chamber the pressure created by the pushing of the plunger will slow force the coffee out of the filter into the mug below, producing a very rich coffee. 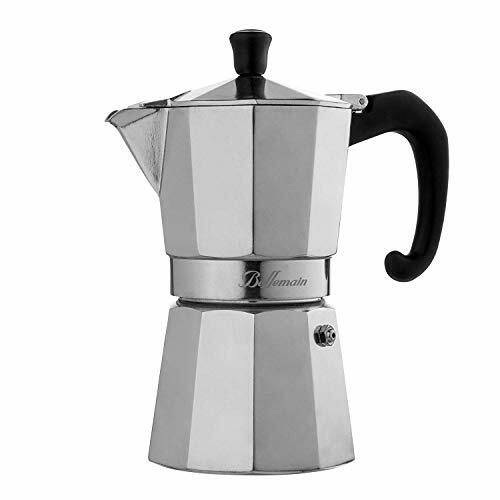 You can use this to brew one or multiple shots of espresso – to make it an americano, simply dilute with water. To make it a latte, just add gently frothed milk. What espresso drinks can you make with these machines? Now that you’re almost ready to buy your espresso machine(or have already bought it), you may be wondering what drinks you’re now able to make. You’ll be stoked to know that there’s quite a variety of drinks you can brew with these machines: both the low end machines and the high quality machines. I suppose this goes without saying but the first drink you’ll be able to brew is a straight up espresso shot(or double shot, triple shot, and even more if you’re adventurous enough). The default beverage brewed is this – and you can use the shot to make a host of other beverages. If you dilute a shot with water(enough so the combined volume is about 8 ounces), you have yourself a classic Americano black coffee. This won’t be as strong as a single shot, but it will still have the rich flavor and aroma extracted from the brewing process. The intensity will be a bit tamped down because of the dilution, but if you want a really rich Americano drink, these machines won’t disappoint. Most machines can make cappuccinos out of the box, too – either with the reservoir milk steaming system or with a steaming wand. If you’re frothing with a wand, you can simply use a larger quantity of milk and just a little foam on the top to make a delicious latte. Otherwise just steam 4 to 5 ounces of milk and pour it over the shot to get a rich, creamy, and frothy cappuccino. A macchiato is a shot of espresso topped with a tiny bit of foamed milk. Since you have both the capacity to brew coffee and to steam milk, you can make macchiatos, too – just remember to use a tiny bit of milk and place a little dollop on top of the shot. A ristretto is a shot to the extreme. It’s the same as an espresso shot except it’s brewed with the same amount of grounds but half the coffee. Ristrettos are incredibly intense and unless your taste buds are ready for it, you’ll want to dilute it and drink it either as an americano, latte, or cappuccino. Lungo, Italian for long, is similar to an Americano, but instead of being diluted with plain water, it’s diluted with water that passes through coffee grounds. Lungo brews will be stronger and have a more intense color than americanos. Of course, these are just some of the mainstream beverages you can brew. After that, the sky’s the limit and you can try brewing whatever concoction you can imagine. Just remember to write down or note down what you did so you can duplicate it in case you’ve struck coffee gold! Now that you’ve invested in such an expensive machine, you need to care for it and make sure it’s clean so that it will run properly every time and not cause you any issues. You should clean your machine regularly, especially the parts that come into contact with coffee: the filter basket, porta-filter, and carafe. If your machine has a steam wand or milk reservoir, then it is absolutely critical that you clean them after every single use. To clean the filter basket, portafilter, and carafe(if your machine came with one), you can simply wash with warm soapy water. Be careful with the carafe because it’s usually made of thinner glass and is quite delicate. You also need to clean the drip tray, since it will usually get a few drops of coffee on it every time you brew. Use the rough side of a sponge to work on the tiny holes in the portafilter and remove any grit. You may need to dig into the coffee grounds with your finger or a spoon to get them out, since the high pressure of the water packs it into a really tight disc. The same goes for cleaning the drip tray. To clean the milk frothing wand, I usually let a puff of steam out to clear the nozzle of any residue, then use a wet/damp towel or napkin to wipe the milk residue off. If there’s any old residue stuck you may need to use the rough side of a sponge or an old toothbrush and get it out. Milk reservoirs can be washed in warm soapy water(check the manual to make sure it’s dishwasher safe before attempting to use one) and if there is a rubber pipe, hold it under warm running water to get everything out. Milk reservoirs often contain parts that have little nooks and crannies that milk can splash into, so you’ll need to wash as soon as you’re done so the liquid milk is washed away. Once milk evaporates and you’re left with the residue it is much harder to remove. As for maintenance, de-scale the machine every 2 to 3 months. If you have not used the machine for a while then it is absolutely critical you descale, as a buildup of limescale inside the pipes of your machine can easily screw up even $1000+ machines. You can use a descaling solution made by the manufacturer to go through this process. Manufacturer descaling solutions are quite expensive, so I would not recommend using it unless you have a very expensive machine. For machines with a more mid-range price tag, use a simple citric acid solution. You can find citric acid crystals in most supermarkets(they’re used commonly in baking), and about a tablespoon dissolved into a gallon of water will give you a nice acidic solution. To descale, instead of using water, fill up the reservoir with citric acid solution or the descaling solution(dilute as per manufacturer instructions). Let it sit for 20 minutes or so. Then run the normal brewing program without the portafilter in the filter basket. Use the filter basket, though, since that helps direct the flow of water. Otherwise it will go all over the place. The descaling solution will run through the entire machine and remove a lot of the scale buildup. If the scale buildup was extreme, you may have to repeat this process multiple times before you get a clean solution. If the descaling is not complete, there will be little white bits of scale in the residue. Regular descaling will keep your espresso maker running in great condition for a long time. Not all espresso machines are the same – even though at their core, they all perform the same functions, there are some small albeit significant differences between machines that product great or ok espresso shots. The core of a good espresso brew is pressure. Cheaper espresso machines tend to be steam powered, where steam is pressurized and forced through the coffee grounds in the portafilter. Higher end machines tend to be pump powered, where the temperature is controlled to a much more ideal 185-195 degrees Fahrenheit and a pump is used to generate the pressure. Pump powered machines usually brew espresso with richer flavor and thicker crema. Budget machines have cheap looking plastic steam wands. These are flimsy and produce OK steam. A good steam wand will swivel to get the best steaming angle, have multiple holes, and will just look and feel a lot more solid and robust. If you’re into cappuccinos and want deliciously thick and foamy milk with coffee, get a machine with a good steam wand. Most espresso machines have just a single boiler for the espresso shot and the steam/milk reservoir. In this case, you’ll have to wait between the shot being brewed and steaming the milk, since the steam can only go in one direction at a time(that’s just how the machines are built since the temperature needs to be controlled). Here we’ll quickly go through some of the common queries we had when we first bought our machine and what we hear from our readers. Should I use coffee beans or pre-ground coffee? This is an entirely personal choice. For a full barista experience, use coffee beans and grind them right before you brew. Grinding right before brewing brings out the richest flavors – if the coffee sits for too long after grinding some of the flavors are lost. Most machines with grinders also have the option to brew from pre-ground coffee, too, so if you’ve got the budget to get a super automatic machine, you have a choice of grinding or using ready grounds. Otherwise, there are some pretty good grounds available online that you can use for making really nice coffee. If you’re only strapped for time, then I’d suggest a halfway compromise – buy beans, and grind a few days worth so you don’t have to grind every time you brew. This way they’ll still be fresher than factory done grounds, but you’ll have ready coffee lying around to use every time you crave a shot. Remember: espresso needs very fine grounds to extract the most flavor. What are the best espresso machine brands? A few names pop up every time you look for espresso machines: DeLonghi, Gaggia, and Rancilio are authentic Italian manufacturers that make truly authentic machines. 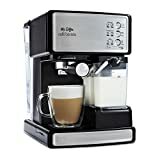 Recently other companies have also popped into the espresso machine market, and they’re doing a pretty good job: Nespresso, Mr Coffee, Hamilton Beach, Cuisinart, and Breville also make very good machines – especially in the mid-range(think semi-automatic). Tamping is the art of compressing the espresso grounds in the portafilter so they’re packed tightly enough for intense flavor extraction, but not too tightly so as to restrict the flow of water around them. How you tamp is a matter of personal preference. You’ll get the hang of it as you practice, brew, and notice differences in your coffee. There’s so many variables to adjust! It feels overwhelming! These are just some of the main factors. My suggestion is work from the top of this list, down. The most striking difference in taste will be noticed by using different coffees. At the start of your journey to become a professional barista, sample a variety of coffees to establish which one(s) you like best. Once you’ve zeroed in on coffees, start making minor adjustments to the shot volume. Once you’ve got the volume down, start varying the time of grind, how fine the grind is, and how concentrated the tamp is. You can repeat this for every variety of coffee you like. Of course, this is only if you really really want to go professional. If you have to go the budget espresso machine route, then you want to stick with a brand that you know delivers every single time. DeLonghi is one of the best known brands in the espresso machine world and their machines are just unbeatable when it comes to brew quality, durability, and ease of use. The EC155 is pretty basic but will get the job done. One of the best features is a removable 32 ounce water tank, which means it is a lot easier to clean and store, especially if you have not used it for a while and have to descale it. It has a self-priming feature which keeps the water moving inside it, which is good – and there is a simple steam wand which will do the job well enough. Since this is a simple machine there is no grinder or steaming jug – you will have to buy those two separately. If you don’t want to go through the trouble you can just steam in a regular mug and buy pre-ground espresso beans, too. For a price tag of less than $100 the EC155 can’t be beaten as an entry-level espresso machine.